Hi everyone! Man, I cannot seem to keep myself out of trouble. No sooner had I recovered from the flu then I sprained my ankle. It's minor, but still enough to hurt a lot and make work that much more draining. AND I broke a nail :( it's the middle one on my swatching hand! 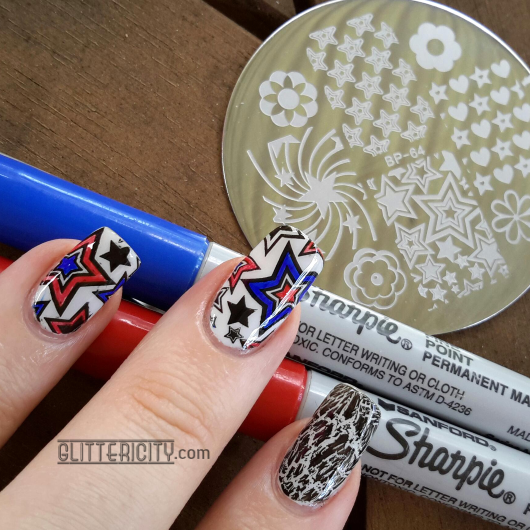 I got this stamping plate from Born Pretty Store and wanted to use that big star image in the middle, so that's what I did! I didn't lay that down the wrong way--I guess it just bled underneath or mixed with the black lines or something. Horrible! Not every polish works for this, right? So... I wiped that mess off and started over. The base for all this is OPI My Boyfriend Scales Walls. 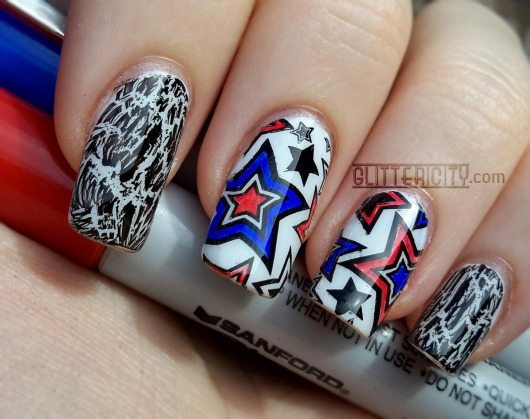 The index and small fingers have a coat of OPI Black Shatter over them, and then the stars were stamped with Konad black. 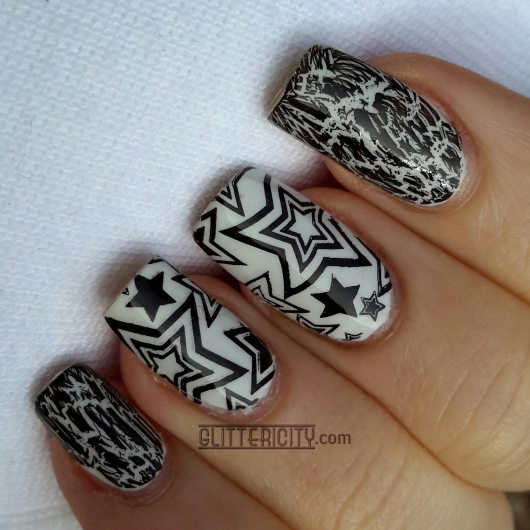 Here's what a nice regular stamping looks like--much better! ooh goodie that clean white makes me look so tan! 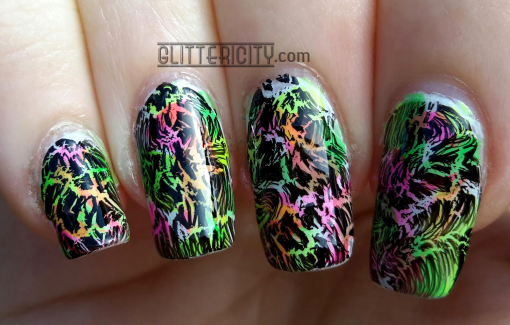 Bonus pic of my right hand--I did them in neon colours with Black Shatter over it to match the original idea, and although it ended up clashing with the final design, I still like it. 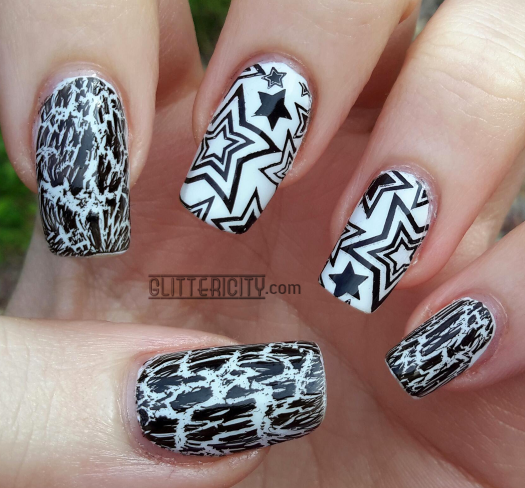 I applied the crackle polish in a swirly motion and it really came out looking cool! So, yeah. This plate is really awesome! 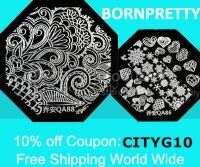 The etching is perfect, and unlike most plates, I actually love every single image on it. 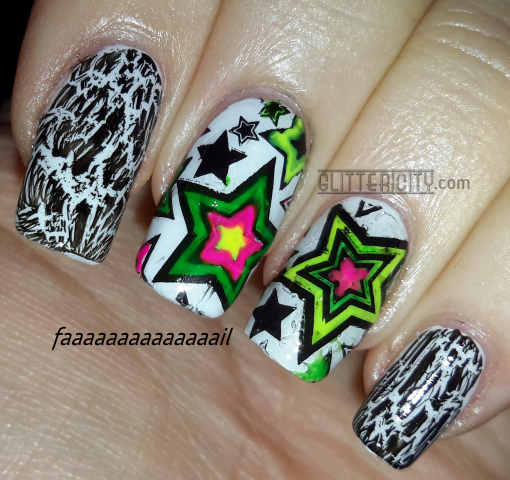 Maybe next time I try some reverse-stamping, it won't look like the 90's vomited on my fingers.